HP has announced the HP 14 Notebook, a budget notebook retailing for only RM999. 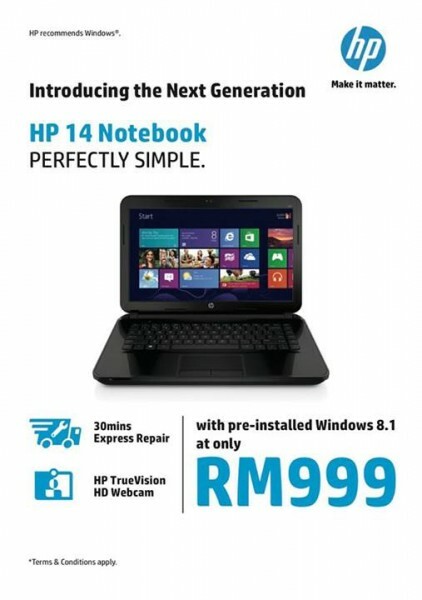 The notice appeared on the HP Malaysia Facebook page, and includes Windows 8.1 pre-installed on the device. Inside, the HP 14 features 2GB DDR3L RAM and a 500GB SATA HDD; although details of the product are mostly unavailable. It should be noted that we have been unable to locate the exact model of the HP 14 on HP Malaysia’s website, as the RM999 version is still listed as being sold with Free DOS. The Windows 8.1 model listed on the website has an AMD Dual-Core E1-2100 APU, although that is being sold a RM1,149. It is conceivable that this version of the HP 14 Notebook has had its price revised for the retailers. We will be listening for more news about this announcement as HP itself has not made an official comment. Edit: We’ve visited the HP store in Midvalley and discovered that it is indeed the AMD powered version of the HP 14 Notebook.